In part 1, we learned about Docker and created a Dockerfile that provides a suitable environment in which our application's services can run. If you recall, our sample application has two services, a Node backend API, and a React front-end. In part 2, we will use Docker Compose to orchestrate our application's services during development so that we can run our distributed application with a single command. This instructs Compose to create a service called api (api:) using the Dockerfile in the current directory (build: . ), map the container's internal port 3000 to the host's port 3000, mount /api in the container at /app, and upon execution, run npm start in the container and start our service. This runs the api service defined in our docker-compose.yml and executes npm install within the container, ensuring that the dependencies are installed against Ubuntu (and not our host's operating system). Because we mounted /api within our container, we can edit /api/src/index.js in our host environment, and these changes will be detected by nodemon, automatically restarting our Node server. It does not matter where we develop our application; Windows, Mac OS X, or your favorite flavor of Linux, our application executes in the same, consistent Ubuntu environment immune to the inconsistencies of our host environment. This instructs Compose to start our api service whenever our frontend service is started. frontend_1  | webpack: Compiled successfully. Navigate to http://localhost:8080 to see our distributed application running. 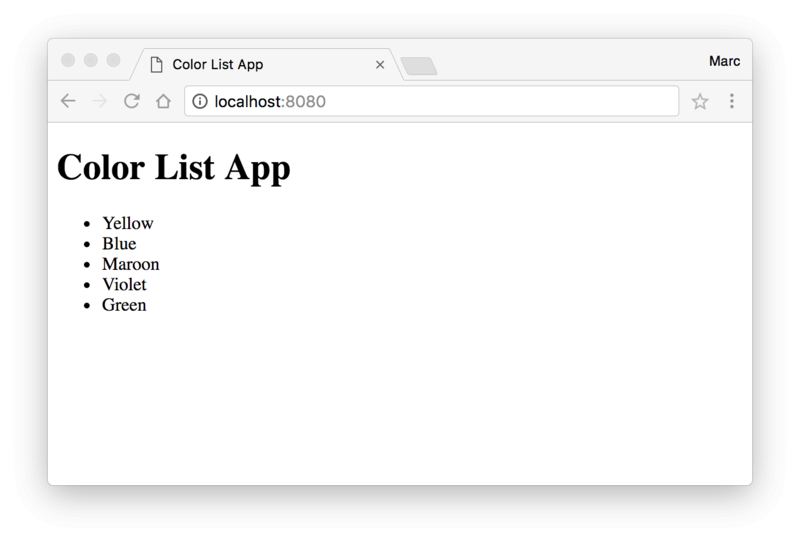 webpack-dev-server renders our front-end React application and, through http://api:3000, requests the list of colors from our back-end API service that are then displayed in our React application. Because we have mounted /frontend within our container, any changes to our front-end code will trigger a webpack rebuild automatically, just like with our back-end service. Just like with docker, we can also use docker-compose up -d to run our application detached from our current shell and docker-compose exec api bash or docker-compose exec frontend bash to bash into a running container. We can even stream logs from our running services to our shell with docker-compose logs -f.
Like the FROM instruction in a Dockerfile, the image: postgres and image: redis instructs Compose to use the latest images in the Docker repository for PostgreSQL and Redis, respectively. When consuming images with Compose, be sure to check the repository's information on Docker Hub for additional configuration instructions. For example, you can set username, password and database name via the environment: instruction for PostgreSQL images. Also via the environment: instruction, pass in any connection information to services that need it. Our back-end API service does not connect to PostgreSQL or Redis now, but when we need to, we can simply use process.env.POSTGRES_URI and process.env.REDIS_URI to connect to those services, respectively. Finally, use the links: instruction to ensure that when our back-end API services starts, our PostgreSQL and Redis services start as well. After editing our docker-compose.yml, run $ docker-compose up to automatically build our newly added services, and start our application. We have learned about what Docker is, how it is different from virtual machines, and some associated terminology. We created a Dockerfile and learned how to work with it using docker build, run and exec. We extended our Dockerfile, creating a suitable environment in which our application's services, composed of a Node/Express back-end API and a React front-end, can run. Finally, we used Docker Compose, and docker-compose build and docker-compose up, to orchestrate our application's services for development. With Docker, we can ensure that our developer can run our application with a few simple steps and start contributing to our applications' development in minutes.